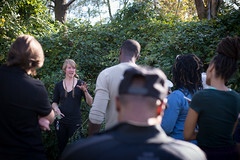 Community Supported Agriculture is an alternative locally based economic model of agriculture and food distribution. 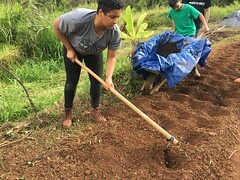 It’s a relationship between the community and the farmer. 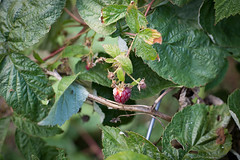 Members pay at the onset of the growing season to pick up a share of the harvest every week. Selling our produce before the season allows us to focus on the actual farm work. You gain the peace of mind that comes from knowing how and where your food is grown. 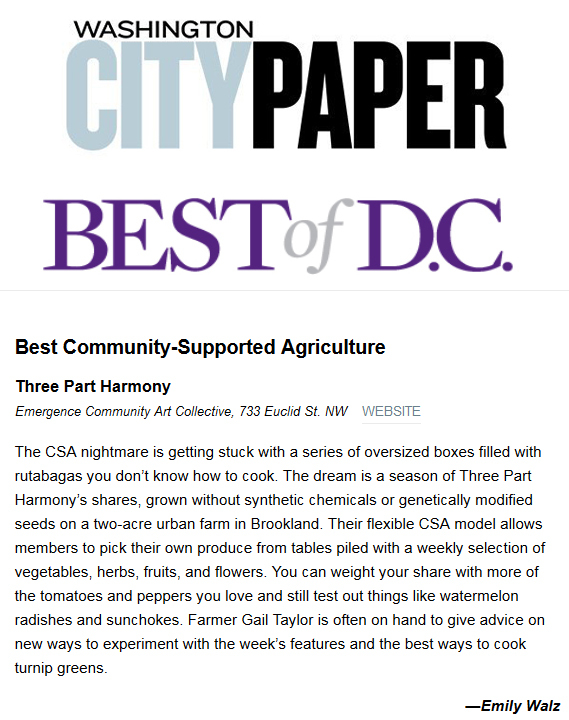 Three Part Harmony Farm (3PH) organizes a multi-farm CSA. That means up to 30% of your share will come from our partner farms that supply fruit, cheese, honey, rice, herbal products, and eggs. As we expand, we add new items. Each week, we send you an email to let you know what to expect in your share and which farm produced it. The main season goes from May – November. We have 2 locations that do an early spring season. See below for details and to read the differences between each location. There are two ways to pick up a share: market style, and porch pick up. 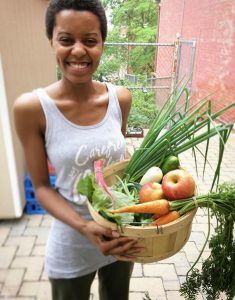 A market style CSA share means that we put all of the items out on the table, and you choose the number of items you want (six for single size, twelve for family size.) For the porch pick ups, we bag six (single size) or 12 (family size) items and drop them off on a porch. It’s important to choose a day of the week, time window, and location that works for you when joining the CSA. Most people choose a porch pick up because the location is incredibly convenient so it works well for you to do that every week. On the other hand, if our market style pick up locations work for you, that option is much more flexible because you pick out your own items, and you can skip up to four weeks without missing any shares. Also, at the market style pick ups, everyone who has a single size share can take the family size any week so that also helps make sure you don’t miss any shares. The porch pick up options are in Parkview, Petworth, Brookland, and Takoma Park. UPDATE MARCH 10: Sign ups for the Spring Session at Lee and ECAC are now closed. If you are a returning member and missed the deadline, please contact me directly and I will find a space for you. Click here for more info on what’s in a CSA share. Please fill out the google form or choose an option from the items below. Tuesdays from 4 – 8 pm in Parkview ( 400 Block of Park Rd NW) Parkview family size share $891 or Parkview single size share $526.50. Wednesdays from 4 – 8 pm Petworth (700 Block of Upshur Street NW) Petworth family size share $891 or Petworth single size share $526.50. Thursdays from 4 – 8 pm in Brookland (17th and Otis NE) Brookland Family size share $891 or Brookland single size share $526.50. 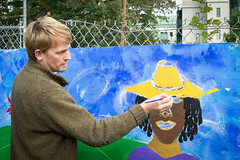 Thursdays from 4 – 8 pm Takoma Park (near TPSS) Takoma Family size share $891 or Takoma single size share $526.50. 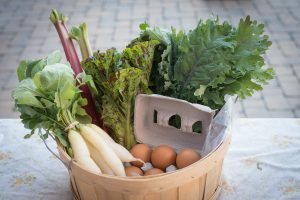 2019 Spring Season CSA Share Market Style pick up from May 1 – Nov 6 on Wednesdays from 5 – 8 pm on Capitol Hill (14th and C Streets SE): family size share $825 or single size share $487.50. 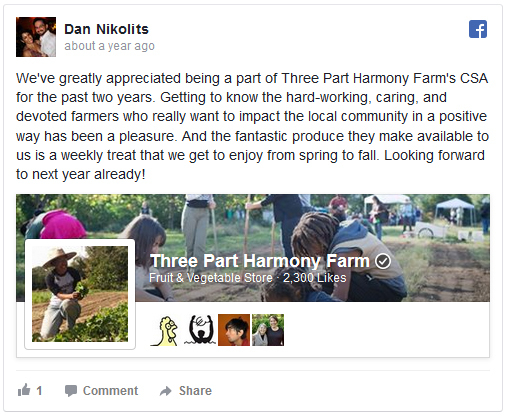 Three Part Harmony Farm is an approved farmer in the the Farmer’s Market Nutrition Program and the Produce Plus Program. The prices for anyone paying with Get Fresh checks or Produce Plus checks are $15/ week for a single share, and $25/ week for a family share. Participants in these programs will not pay in advance (the option of using Get Fresh or Produce Plus checks is not available for the Brookland or Takoma Park pick up locations). 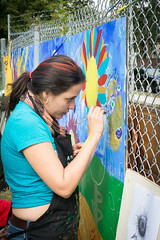 We mostly grow produce that thrives in this region. That means in the spring and fall we grow a lot of greens and roots. To keep it exciting, we have many variations on salad greens and cooking greens in the mustard family plus lettuces and spinach. To change things up and make dinner exciting, you might see pea shoots in the salad mix, agretti as a cooking green, and definitely sweet potato greens and lambs’ quarters when it gets too hot for lettuce. In the summer, old standards that we recognize from the grocery store come into play such as tomatoes, peppers, eggplants, okra, potatoes, and garlic. Even though we promote local and seasonal eating, sometimes we push the envelope and dabble in something that’s just fun and cool to grow, even if that means giving the plants extra care. Year after year we experiment to add unique items like ginger, turmeric, and Indian squashes such as ghia and tinda. At the pick up, you weigh some items or choose bags/ tins/ bunches/ quarts/ pints that have been pre-weighed. There are always multiple options in a category, so if you are asked to take home 4 pounds of produce listed in a certain category, that doesn’t mean that you have to take some of everything listed, it just means that the total combined weight of all the items can’t exceed the 4 pounds. This is how we are able to make sure that you don’t have to take vegetables you have tried and don’t like, by putting them in a category with other items you hopefully like. We come up with the number of pounds per member based on what the harvest was that morning. 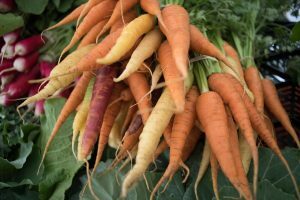 Since we assume you are going home and making multiple meals from the share, we try to give you options to take moderate amounts of more kinds of produce, that way you are not making 4 meals all with potatoes and/ or kale in them. Unless you are cooking for your kid’s soccer team and you need a million quarts of mashed potatoes- then by all means take only potatoes! It’s flexible that way, and you can do it different ways each week depending on what’s happening in your kitchen. Another important goal for us is that you are happy with the variety of produce you receive, keeping in mind the restrictions our climate gives us, and that you are content with the number of culinary challenges we present to you each season as we give you vegetables you’ve never seen before or heard of! We hope to build a relationship of trust, and encourage you to try everything at least once. 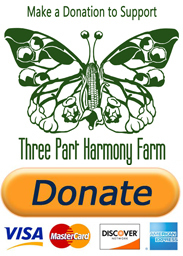 If you have more questions, please feel free to email Gail at gail@threepartharmonyfarm.org. It’s hard to answer all of the questions in one blog post. It can be a big decision to make as a household, which CSA to join. It’s important to choose the right day of the week, location, and style of pick up. If this one is not right for you, I can make recommendations. There is nothing worse than having buyer’s remorse in May- it’s a long season, and hopefully a tasty and fulfilling one for all of us!